Bio-Touch is a gentle touch-healing method. The practitioner uses the first two fingers of each hand to lightly touch (butterfly-like) precise points on the body of the recipient. These points correspond with specific health conditions. For example, points are touched around the ﻿ears﻿ to help alleviate dizziness. The combination of correct points and light touch enhances the body's natural healing ability. Bio-Touch is considered a type of bodywork therapy, such as yoga, reflexology, t'ai chi, and massage therapy, which are used to promote, maintain, and restore physical, emotional, mental, energetic, and spiritual health. Bio-Touch is easy to learn - in fact, so easy that even children can learn and practice it effectively! Research shows that Bio-Touch significantly reduces stress and pain levels, and alleviates symptoms of disease. There are no philosophies or beliefs to adopt, no masters or gurus to train under, and no levels of achievement to attain. Bio-Touch is the perfect complement to any healthcare program. 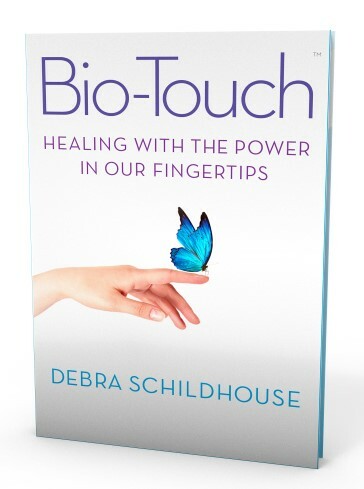 "I would like to take this opportunity to share two lessons I have learned from my involvement with Bio-Touch, especially as they relate to other healing practices that fall under the general rubric of energy healing. The first lesson is that it appears that there is no substitute for direct physical touch between the provider and the recipient. The second lesson is somewhat deeper and frankly more inspiring to me and maybe to you as well. The lesson relates to a theme expressed through Debra's book, the importance of love and the process of receiving and giving non-sexual loving touch. The kind of love that Bio-Touch fosters is a high level of love." "Our research confirms that Bio-Touch has an immediate and sustained favorable effect on bodily pain and physical conditioning in addition to an overall improvement in Quality of Life Scores in patients. Bio-Touch is a low tech, low cost solution for many families in my practice." Bio-Touch is taught through the International Foundation of Bio-Magnetics (IFBM), a federally approved 501(c)3 education and charitable foundation. Its Vision is to encourage all people to take responsibility for their own healthcare, empower them to assist others, and create a community of people worldwide dedicated to service, self awareness, and recognizing the equality of all humanity — thus forming a chain which shall go on indefinitely.